CSWD Drop-Off Centers (DOCs) accept household quantities of trash, blue-bin recycling, food scraps, and more. DOCs are open to the general public for use, regardless of town of residence. CSWD Drop-Off Centers are do-it-yourself (DIY) facilities. Please come prepared to unload and place your materials into the appropriate collection container yourself or bring along the extra muscle power you need. We accept cash or checks only. Checks must include your name, current address and phone number. Hinesburg Closed during construction of Town Garage: Learn more. DOCs accept limited quantities of trash, recycling, food waste, batteries, scrap metal, and more. Some DOCs accept bulky items (mattresses, furniture). 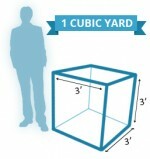 For other items, drop-off is limited to 1 cubic yard of any material. For more information about disposal & recycling options, search for your item in our A-Z list. Customers may pay a $5.00 equipment loading fee (in addition to any applicable disposal fee), for bulky or heavy items such as a sleeper sofa, riding lawn mower, cast iron bathtub, exercise equipment, etc. This option does not refer to assistance in unloading the items from your vehicle. This fee permits the customer to leave the item on the ground in a designated area of the facility to be loaded into the appropriate bunker or container later by CSWD equipment operators. Please note that, due to their fragile nature, the equipment loading fee cannot be applied to the handling of TVs and other large electronic devices. These devices must be placed in the appropriate area by hand or on a dolly, and the customer is responsible for careful placement. Close the local food loop and pick up a bag of compost right where you drop off your food scraps! All CSWD Drop-Off Centers now carry a selection of Green Mountain Compost products. View their full product list on their website. Premium Topsoil: $4.49 + tax If chemical-free, lush lawn grass and thriving garden beds are what you’re after, try our organic Premium Topsoil. It’s high in organic matter to give plants a boost and improve soil structure for optimum drainage. It’s also super easy to spread and great for a wide variety of lawn and garden applications. Premium Raised Bed Mix: $8.99 + tax For best results in raised beds or containers, the soil needs additional structure to deliver ideal levels of oxygen, water, and nutrients to the roots. This deliciously rich blend of natural, organic nutrients and minerals is designed for building and recharging raised bed and container environments. Premium Potting Soil: $9.49 + tax Professional-grade, organic Premium Potting Soil, custom blended for the perfect balance of texture, moisture retention, and drainage. Made from our organic Premium Compost, regionally-sourced sphagnum peat moss, aged pine bark, and a mix of organic fertilizers.